Not unlike certain melancholy household pets, the people in Ian McEwan’s novels are always gazing out of windows. Briony Tallis is doing so in Atonement when she witnesses the crucial scene by the fountain between her sister, Cecilia, and Robbie Turner; the narrator of Enduring Love spends much of the book looking out the window for his mad Christian stalker. “Each afternoon,” runs the first sentence of The Comfort of Strangers, “when the whole city beyond the dark green shutters of their hotel windows began to stir …” It is as if McEwan had received a garbled version of Orwell’s dictum that “good prose is like a window pane.” Or, somewhat more likely, he is protesting violently against it: Here is your window pane, says McEwan, look how it’s separated my characters from the world. 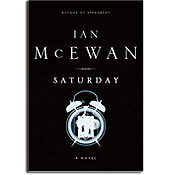 McEwan plots his books along a strikingly uniform arc: He begins with a modern urban character suffering from loneliness and anomie despite a seeming façade of contentment and affection, and then proceeds to terrorize the character into contact with life. There is a technical mastery to the constructions that borders on the clinical and mirrors the characters’ own lack of affect. If the people in McEwan’s novels occasionally wonder why they cannot feel, one occasionally wonders if it isn’t because McEwan never taught them how. The exception was his last novel, Atonement. It seemed to herald a more expansive and even courageous McEwan; no other word than courage can describe a grown man’s sudden decision to begin writing exactly like Virginia Woolf, and then to lift his love plot directly from the Hollywood flight-school film Top Gun—“I’ll wait for you,” Cecilia says to Robbie as he goes off to fight the Nazis. “Come back.” The result, for all that, was a powerful, evocative novel about Britain just before and then during the war. The short concluding section of Atonement—in which, in effect, McEwan disclaimed not only the plot of the previous sections but also the style—marred the novel, but also left open the possibility of a more perfect production the next time around. Four years and a series of catastrophic world events later, the new production, Saturday, is here. It begins with its hero, the successful neurosurgeon Henry Perowne, gazing through the window of his house at what might well be another major calamity: A plane is flying over London, on fire. Thomas Pynchon’s Gravity’s Rainbow also famously opens with a burning projectile over London, and whether or not McEwan is alluding to it, the comparison is instructive. Pynchon: “A screaming comes across the sky.” McEwan: “Above the usual deep and airy roar is a straining, choking, banshee sound growing in volume—both a scream and a sustained shout, an impure, dirty noise that suggests unsustainable mechanical effort,” etc., etc. Pynchon’s sentence contains no adjectives; McEwan’s two clauses contain ten. The desired effect is vividness, proximity; the result is the opposite, with the adjectives muffling the screaming, so that it is no longer screaming but only screaming-that-is-being-written-about. Few contemporary writers are as fixated as McEwan on physical violence; yet no one’s prose is less violent than his. At his window, Perowne experiences the burning plane as more than just a plane: It is an emanation of the News, like the sighting of a famous television personality on the street. He does not rouse his wife—as he says to himself, in one of his creator’s occasional slips into bathos, “Why wake her into this nightmare?”—and instead spends the next half hour waiting for the news cycle to catch up with what he’s already seen. The results are mildly disappointing, but throughout the day that follows, as he prepares for a big family dinner, Perowne will continue to meet the News in similar ways. It is February 15, 2003, and hundreds of thousands of protesters have massed in London against the impending invasion of Iraq. The protest is as ineffectual as it is large. The decision, as everyone knows, has already been made: “The precise date must already have been fixed,” Perowne thinks, “as though for any big outdoor sporting event.” In Kiev, Belgrade, Beirut, huge gatherings can bring down governments; in the West they are merely another form of entertainment. The protest’s effect on Perowne, who watches it through the window of his Mercedes, is to occasion some commonplaces about the War on Terror and to close down the street he usually takes to his squash game. We are inside Perowne’s head the entire time. We know that he feels cut off from life, in part because he tells us and in part because he is so emotionally obtuse. He stumbles repeatedly over his inability to know not only what weapons Saddam really has but also what it’s like to be anyone other than who he is. In the midst of an argument with his daughter, he wonders whether it is self-indulgent to be “fighting over armies they will never see, about which they know almost nothing.” In that sense, Saturday is, like all of McEwan’s novels, a product of liberal guilt—the idea that things are more real and more painful elsewhere and that our actions don’t have much to do with them. The model deals with its own self-hatred by precipitating an awful crisis that will force the characters to “face” life. As if life, otherwise, would not quite have happened to them. Here the adjectives roll forth almost comma-less, as though inseparable from the objects they describe. But, significantly, Theo is made to resemble a new toaster oven. This is the corollary to McEwan’s window-philia, the essence of his worldview: We experience each other as machines, mouthing words that don’t really mean anything (“I love you,” Perowne keeps telling his wife, as though saying it will make it so). And occasionally we commit actions, and only those are real. At the end, like machines, we break down: The first chapter of Saturday includes a six-page tour de force on the various insults that the human brain is subject to: “He clipped the neck of a middle cerebral artery aneurysm—he’s something of a master in the art—and performed a biopsy for a tumour in the thalamus, a region where it’s not possible to operate.” There is never, really, anything to be done. Saturday is not a suspenseful novel; after the march forces Perowne into a minor car accident, the book heads with great deliberation toward its crisis. When it finally comes, the crisis is awful and McEwanly lurid. Perowne’s daughter Daisy is forced to recite a poem as her mother is held at knifepoint. She chooses “Dover Beach,” by Matthew Arnold. “Ah love,” it goes, “let us be true / To one another! for the world, which seems / To lie before us like a land of dreams … Hath really neither joy, nor love, nor light, / Nor certitude, nor peace, nor help for pain.” The recitation has a profound effect on the knife wielder, and also on Perowne, who has never heard of the poem. His ignorance is played for comedy in the scene—thinking that the poem is Daisy’s, he wonders who this “lover” is—but more important, it is revelatory of character. That a successful neurosurgeon will not only never have read “Dover Beach” but will also not have any idea who Arnold is, is an implausibility, almost a kind of joke. A novelist as meticulous as McEwan would not insist on it (and he does insist, to the point of clumsiness—“Arnold who?” says Perowne, and then, 40 pages later, “Arnold someone?”) without good cause. The cause here is polemical and close to the idea at the center of all McEwan productions. Modernity has created a certain type—in Perowne’s term for himself, “the professional reductionist”—for whom all of life is only the facts and feelings learned at school. It has created a society of professionals. McEwan is skeptical, sometimes brutally so, of this society: It has made us unfeeling, and unsure. But it has been his method, and even his genius, to accept its premises. In crafting grim, carefully structured novels in which characters receive their comeuppance—but, at least in his recent work, never too, too much of it—he has become the consummate professional novelist. Like the neurosurgeon, like the lawyer, like the war planner, he does not make it his business to reach outside the bounds of his particular task. In making use of his significant talent in this way, he has abandoned the modern novel’s protest against modernity. “If man will strike,” says Ahab, “strike through the mask!” Surely the consensus of critical adulation with which McEwan is increasingly surrounded has something to do with his refusal to strike through any masks or shatter any windows. Having pressed further into the reaches of consciousness and pain in Atonement, he has pulled back. Henry Perowne, ultracompetent, scientific, reasonable, in the end supports the invasion of Iraq. The daytime glass through which he sees the world becomes, at night, a mirror. He flinches, seeing his reflection—but not for very long. Nan A. Talese. 304 pages. $26.